In the maze of seemingly endless unchecked crimes against justice and the American people by the White House, the courts continue to offer the greatest hope. Separate from the beavy of Trump-Russia investigations and the President personally, his administration's actions have been the focus an unprecedented number of court challenges. 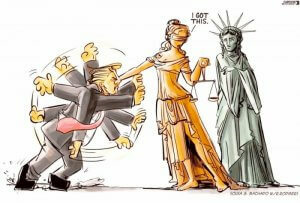 According to the Washington Post, federal judges have ruled against the Trump administration at least 63 times over the past two years, "an extraordinary record of legal defeat that has stymied large parts of the president's agenda on the environment, immigration and other matters." Legal observers attribute the loss record to the hasty and haphazard actions by both the President and his administration -- that appear to be less about implementing serious policy change, and more about public pronouncements geared toward the moment and media. 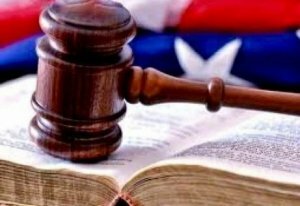 While the temperamental tweeter has personally contributed to the downfall of some of the court cases, the majority of losses are attributed to blatant violations of the Administrative Procedure Act, the federal law that governs administration agencies. The APA requires the government to defend policy changes using factual evidence and explanations, and sometimes requires a public comment period. In nearly two-thirds of the rulings, which cover more than 30 major cases, judges have rebuked Trump officials for ignoring or violating the most basic tenants of governance. The challenges to the administration's policy actions come primarily from environmental and healthcare groups, immigration, public interest and civil rights organizations, and individual states. The most prominent agency offenders include the Environmental Protection Agency, Department of Interior, Department of Energy, Department of Homeland Security and the Department of Health and Human Services. A number of cases are still expected to make their way to the Supreme Court of the United States. 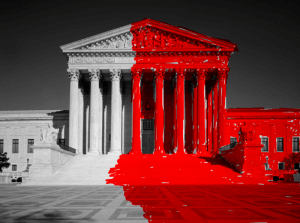 On March 15th the Supreme Court agreed to expand the scope of the case on the 2020 census citizenship question, scheduled to go before the high chamber on April 23rd. The judges approved a Trump administration request to include the question of whether the Constitution lets the government ask whether people are American citizens. The move comes after the ruling by a federal judge in California earlier this month that Commerce Secretary Wilbur Ross, whose agency oversees the census, violated the Constitution's Enumeration Clause because the citizenship question prevents an accurate count of US inhabitants. In January, Judge Jesse Furman of the US District Court for the Southern District of New York ruled that the citizenship question, which had been added to the upcoming US Census form at the request of the Department of Justice last year, was "arbitrary and capricious," and an "egregious" violation of the Administrative Procedure Act. On the same day, President Trump signed a proclamation, vetoing a resolution passed in both the Democratic-controlled House and the Republican-controlled Senate, to overturn his emergency declaration and transfer of funds to defray the costs of his US-Mexico border wall. Lawsuits filed challenging Trump's use of presidential powers to invoke the National Emergencies Act and funding are expected to reach the Supreme Court. Yesterday, three judges in the fourth circuit court of appeals heard arguments against a suit filed by Washington, DC and the state of Maryland charging President Trump with violating the Emoluments Clause of the US Constitution. or domestic government entity. DC Attorney General Karl Racine stated they are prepared to take the case to the US Supreme Court. DemDaily: What is Net Neutrality?